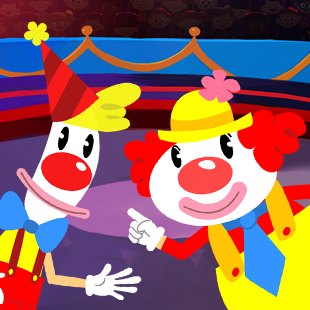 Yoyo & Peanut are two funny circus clowns who couldn’t be more opposite. Yoyo is tall and clumsy, while Peanut is short and assertive. Together they enjoy different adventures in the circus arena, through which they present opposite objects and words. Each episode of “The Yoyo & Peanut Show” demonstrates the concept of opposites, as Yoyo and Peanut enforce an equally important message that two individuals can be best friends, despite being fundamentally different. See what time The Yoyo & Peanut Show is playing!